Do you have a fake wreath that's as flat as a flitter? One that sheds plastic right and left? One ornamented with styrofoam balls and rayon velvet bows? Here's my frugal method of recycling those old wrecks into fresh wreaths. I did two this morning for the French doors in my kitchen. You can make your own wreath from trimmings without even using a form, but this way is quicker and easier. I see tons of "before" wreaths at yard sales all summer. Ask around--someone you know is sure to have one in an attic or garage. First, remove anything decorative from the old wreath. Flatten its branches and reshape into a circle. You'll use the existing sprigs as wire for fastening fresh branches. Free trimmings usually come in large branches, since they are from the bottom of a tree. Select a woody branch section with many off-shoots. It will look too thick, but that's what you want. Lay the branch across one side of the wreath. 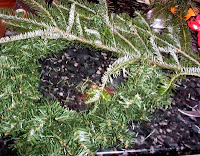 Determine which way it should curve (hint: most of the foliage should point to the outer edge of the wreath). Gently shape it into the curve of the wreath. 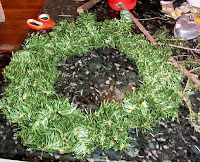 Now cut another, similarly large branch and repeat on the second half of the wreath. Now it's time to start fastening. 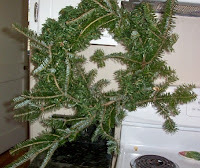 You can tease up two sprigs of wired greenery on either side of a branch, then twist them together over the top. 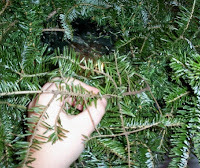 Twisting wires in a few key places will hold the main branches to the wreath. You should also secure them by poking the hard ends down into the wreath. If you can, work the cut end in and out of the wreath form. Hold up your wreath and check to see if it is more or less a circle. It will look wild and wooly at this point! Resist the urge to start trimming. Now is the fun part. Clip the rest of your tree trimmings into small branchlets or handfuls of greenery. Insert these into the wreath where the main branches are sparse. You probably won't need to wire them at all. Simply weave the stems in and out of the fake/real greenery framework you've created. If you want to add in a secondary green, like pine, holly, or ivy, now is the time to do that. A mix of greens always improves the wreath. I haven't had time to cut any extra, though. I decided to use my gelatin molds to decorate the wreaths. I wanted to keep them usable, so I hammered a tiny nail hole into the edge of each one. I used the thin red thread from the yard sale "free box" to attach them. 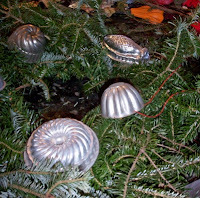 You can add pinecones, ornaments, bows or anything that complements the setting. Raffia or garden twine are both cheap--and natural--ways to tie them to the greenery. The finished product! If you're used to plastic wreaths, handmade fresh ones may look a little too natural at first. To me, that's part of their charm. This renovated pair of wreaths adds just just the right simple touch to my kitchen entrance. I love this timely post as I have quite a few wreaths that need to be 'rescued'! Thanks for sharing such great ideas! Adorable idea. Last year purchased two cheap wreaths to pin greeting cards to, but doing something else (pinning to ribbon "banner"?) thsi year so looking for ideas for the wreaths...thanks! 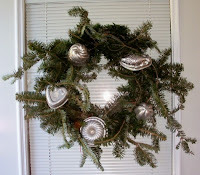 This is a great post and I'm with you on the charming look of natural wreaths! How do you keep your greenery fresh throughout the season? It's still a long time until Christmas, and indoor air is awfully dry! I love the gelatin molds, by the way!